The bird harness (aka bird leash) allows your bird to do what nature intended – to fly! It allows you to walk around with your bird without having to build a super sized aviary or bird cage. Flight is essential to the health of any bird and a bird harness allows your pets to do this safely. Using a bird harness does require a small amount of training for your bird, but when this is complete, both you and your bird will be able to enjoy the great outdoors together. In fact, birds are known to love and bring their harness over to their owners in anticipation of an outing. Continue reading our guide below on which is the best bird harness, how to train your bird to wear a harness, plus safety tips you need to follow. Available in 8 different sizes to match many different species of pet bird (see the size chart below) and a range of different colors. Plus you can replace it for free if you choose the wrong size. Elastic material that stretches as the bird flys to the limit of the cord. This prevents sudden snap back. Escape proof design, no stitches so the birds cannot chew and break apart the harness with their powerful beaks. Very lightweight so it doesn’t hold back or irritate your bird. Some users report issues fitting their harness to their species of bird, so double check the size chart to ensure you order the correct size. The Aviator Bird Harness is the world’s number one bird leash for many good reasons. It’s available in every size you could possible want for your pet birds, it’s made from quality materials that are bird safe and escape proof, there’s clear training instructions on how to use it with the DVD provided and there’s a number of great accessories that are available as well. The people at The Parrot University clearly know what they’re doing. Highly recommended. Is an alternative bird harness product that also comes in a range of sizes and colors. 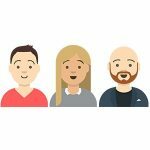 However, some user’s have reported issues with the quality of the materials such as the plastic parts and the fabric of the leash and stitching. Another bird leash alternative. Comes with a slightly different styled design and is of better quality than the Fred bird harness but still not as good as the Aviator. Watch the video from Barbara at GoodBirdInc.com for people to see instructions on how to get your bird to wear it’s leash. 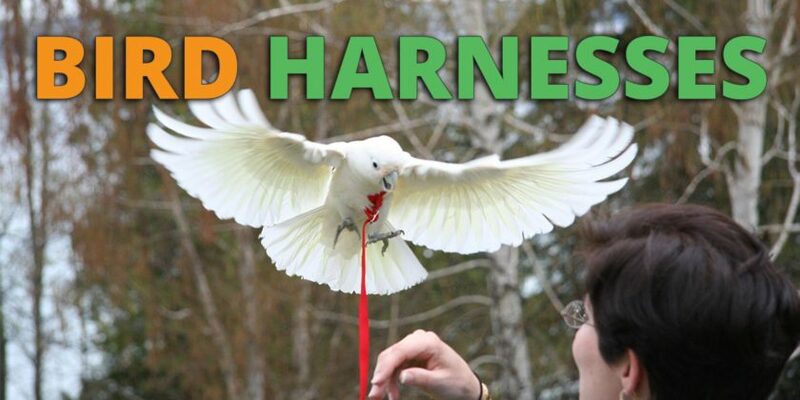 Harnesses work best with birds that don’t mind being touched and are familiar with their owners. Young birds are easier to train than older birds but you still can train an older bird to wear a harness – it just may take longer. To train a bird to wear a harness, it’s important to break the tasks down into small steps and use positive reinforcement and rewards along the way. Some positive reinforcement techniques that you can use are head scratches, food treats, toys and attention. For example, the first step of allowing you to place the harness over the head of a parrot will be reinforced with lot’s of head scratches. Only begin training with the harness when your bird is very relaxed and comfortable. If they’re nervous or in a bad mood, wait for a different time before you begin training. Move very slowly as you apply the harness and follow each step with positive reinforcement such as head scratches. It’s especially important to make each movement very gently when the bird is first exposed to the harness, give the bird lot’s of reinforcement when it is first learning. Always allow the bird to come out of the harness before he shows any signs of discomfort. This’ll prevent any setbacks in training. If your bird doesn’t like being touched then it is good to use a different method of reinforcement such as food treats. If your bird is a bit nervous or having problems, train with a larger sized harness. Then once the bird is comfortable, you can use a harness size that is more appropriate for your bird. Separately train your bird to do a drop behavior. This is where you train your bird to drop anything that is in their mouth when you queue them to. This is useful with harness training because it can be used if your bird starts chewing on the harness. If your bird is not ready to use a harness, then you can use it during play time so that your bird gets comfortable with the object. The first few times that you use the harness, it’s best to keep the bird indoors. Don’t ever leave your bird on it’s own when it has the harness on. Make sure the bird is placed back in it’s cage or carrier when you have to go off and do something else. Dropping the harness by accident is a possibility. You may get startled by something and then drop the harness and the bird could fly away. Because of this, it’s a good idea to provide an extra level of security. A simple way to do this is to tie one end of your harness to your belt or other part of your body/clothing. The same is true if handing off the bird to a trusted friend. If outside, only give the harness to someone you can absolutely trust. For example, if you’re going to bathroom then it would be unwise to hand the bird to a child or stranger. Make sure your bird is comfortable. Don’t get lost in the excitement of walking around with your bird and forget that they may be scared of predators (dogs or cats in the area). Look at how the bird is feeling and if they start getting scared, comfort them and consider making your way back to safety. If having problems fitting a bird harness on very small birds such as budgies or parrolets, then some owners have had success by putting the belt behind the legs and with the tail, not the waist of the bird. Train your bird with the “drop technique” which is where you train the bird to drop whatever it has in it’s mouth. You can then use this technique when your bird is chewing the harness and trying to take it off. Don’t use the harness when travelling at speed, such as in a car, motorbike or bicycle. Check that you have the right sized harness and that it is not too tight. You don’t want your bird to have difficulty breathing. Check the harness is not too tight and creating sores or damaging any feathers. To prevent this, make sure the bird is not wearing the harness for long periods of time. Train your bird to get used to the harness by wearing it for short periods of time, then increasing this amount over a few weeks/months. Instead of using the bird harness at it’s default sized length, you can provide even more flying space for your birds with this leash extension accessory. Available in the following sizes: 10ft/3m, 20ft/7m and 40ft/12m. However, we recommend being extra careful when creating a homemade harness – especially when creating any loops that you place on your bird. If you’re looking for other methods of preventing your birds from flying then you should check out our article on clipping bird wings. Or you might want to consider people that free fly their birds without even using a bird harness in our guide here .